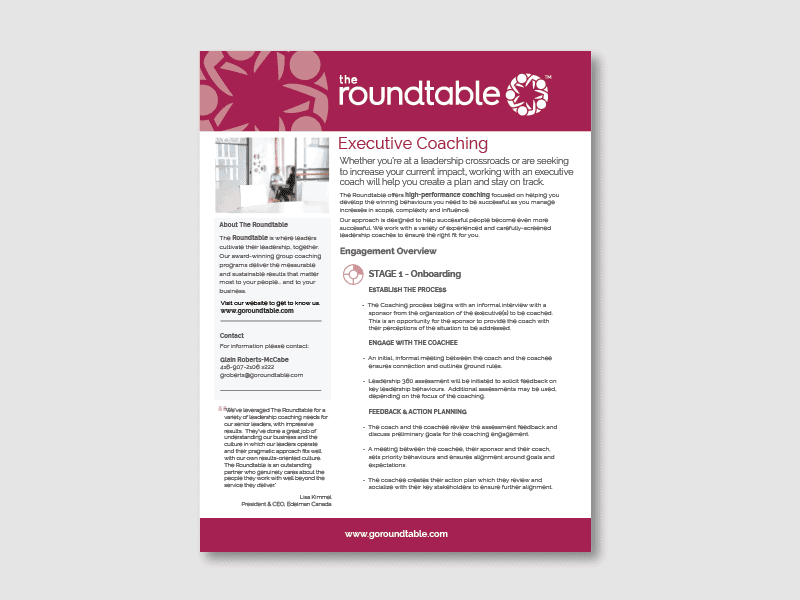 At The Roundtable, we specialize in group coaching programs that help leaders increase their impact, foster collaboration and drive better business results. We bring together leaders to share and explore issues and opportunities; to learn through our unique group coaching approach; and to move beyond the surface of leadership and dig deeper into what really matters. From integration of your existing tools, to tailoring content to meet the needs of your unique culture, to making sure the administration is seamless, our Action Blue Print makes sure all details are smooth reducing your time, effort and stress. From communication to expectation setting, our Go2Launch on-boarding and launch communications guarantees that your participants are engaged and ready to go. Group coaching is both adaptive and adaptable. Throughout our Implement4Results process, we stay connected to ensure the program meets the emerging needs of the business and the participants. Results are tracked throughout the process, not just at the end. Tools and a broad community of support provide participants with continued opportunity to engage, develop and sustain their learning well beyond their group experience. Give your mid-career leaders a dynamic group coaching experience that builds new leadership behaviours while at the same time strengthening self-insight, self-confidence and overall coaching and leadership ability. More powerful than 1:1 executive coaching, group coaching provides organizations with a way to increase collaboration, innovation and business acumen while developing key leaders. 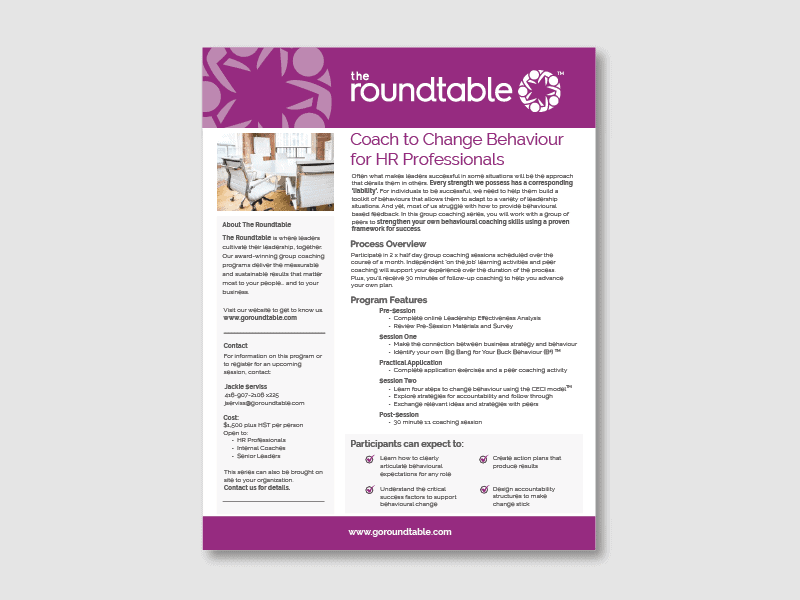 The Roundtable for Leaders is a facilitated group coaching series delivered over 6 to 12 month time frames. Through short, targeted sessions, participants build and integrate new behaviours, practice tools and accelerate their coaching skills while creating learning that’s truly sustainable. 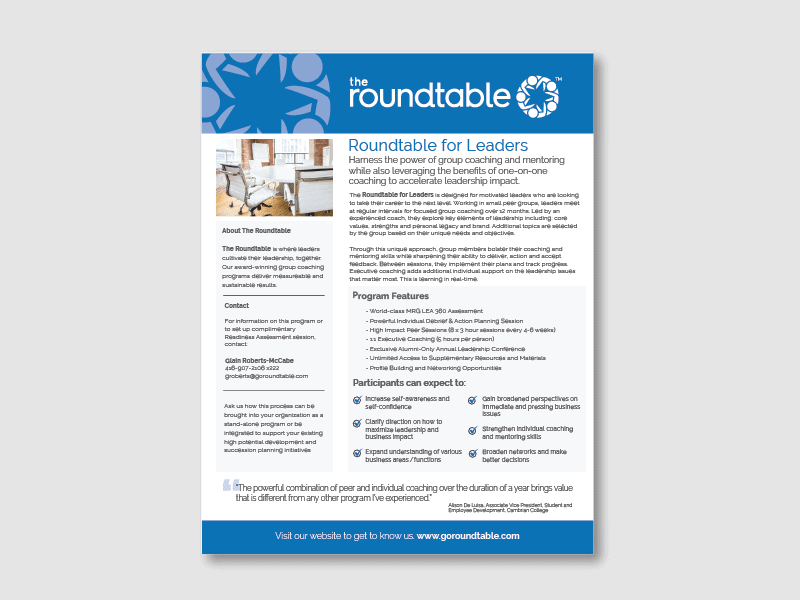 The Roundtable for Leaders provides proven, lasting impact. Participants create collaborative learning communities that endure far beyond the end of a program. 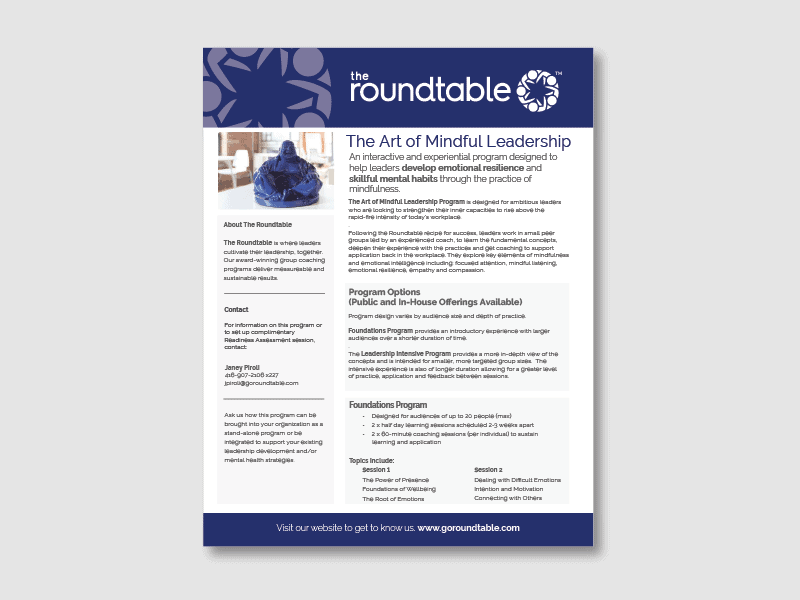 The Roundtable for Leaders is an ideal turn-key high potential program that can also be leveraged for diversity initiatives, new executive on-boarding initiatives or as a way to provide sustainability to traditional classroom programs. Engage your top talent in a unique process that puts them front and centre in developing your next generation leaders. The Roundtable Catalyst engages your high potential leaders to build your leadership bench strength while at the same time, expanding their own leadership capability. 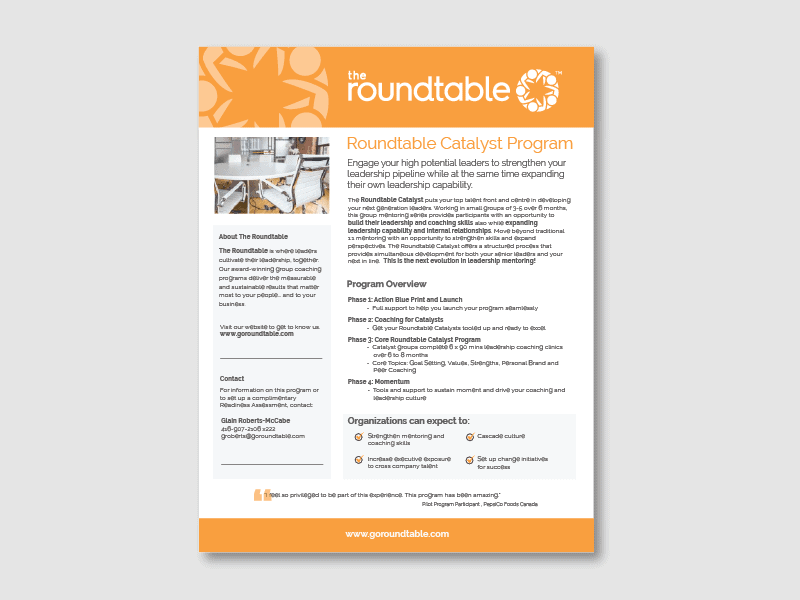 Working with small groups of 3 to 5, our unique Roundtable Catalyst group mentoring series provides participants with an opportunity to build their leadership and coaching skills, accelerate their leadership impact and expand their internal networks. Move beyond traditional 1:1 mentoring programs with an opportunity to strengthen skills and expand perspectives. 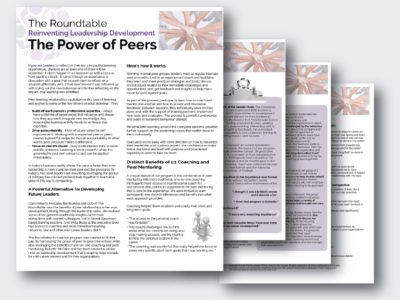 Simultaneously develop your senior leaders and your next generation leaders with The Roundtable Catalyst – the next evolution in leadership mentoring! Move beyond traditional “team building” and engage your team in a process to build working relationships that cultivate a high performance culture. 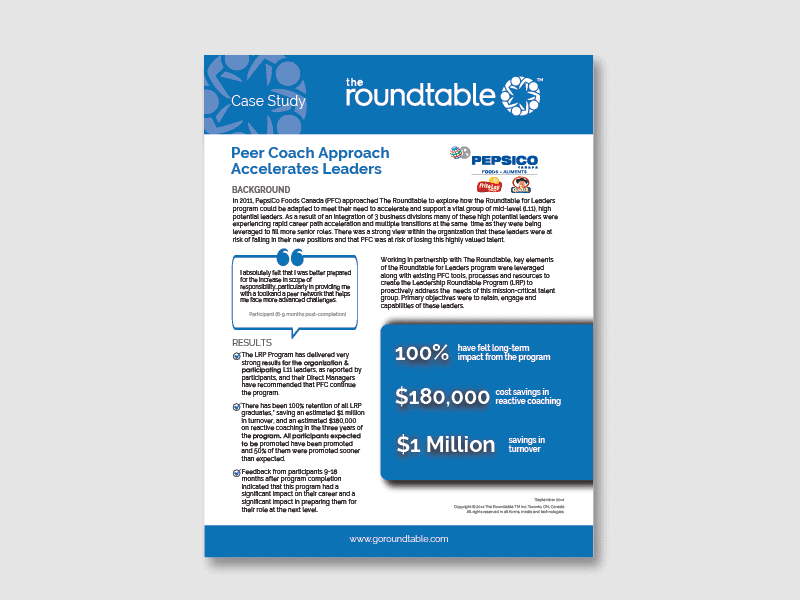 The Roundtable for Teams coaching process will help you define your team legacy, enhance performance, and accelerate results. 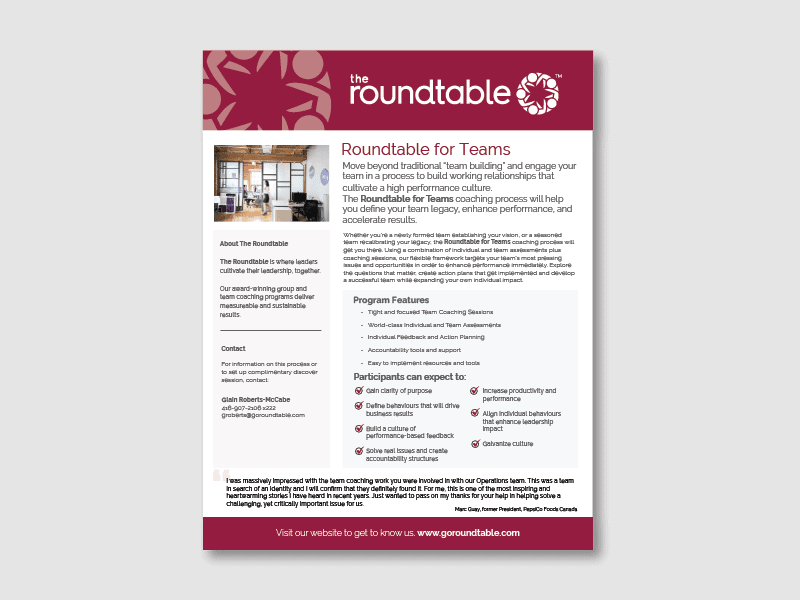 Whether you’re a newly formed team establishing your vision, or a seasoned team evaluating your legacy, the Roundtable for Teams coaching process will get you there. Using a combination of individual and team assessments and coaching sessions, our flexible coaching framework targets your team’s most pressing issues and opportunities in order to enhance performance. Explore the questions that matter, create action plans that get implemented and develop a successful team while expanding your own personal impact. Take the Team Leader View Assessment for FREE to see how your team stacks up on the Positivity/Productivity matrix. We also offer targeted programs for individuals. Learn more about our Executive Coaching packages, Mindful Leadership series and advanced programs for HR leaders.